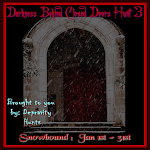 Hunt runs from Dec 1st, 2012 to Jan 1st, 2013. 3) Les Sucreries de Fairy - I'm with textures. 4) Daark -Its not summer in July any longer, but a tentacle keeps hanging on. 7) The Elegant Goth - Hint giver in the store. 3) Naughty Naughty -I am in the mood for a Cocktail "dress that is."